GIFT SETS WITH YERBA MATE - ALL INCLUSIVE!!! Bombilla, kalabas, hot water and a good book -–and I need nothing else…Untidy house, mediocre food and salted mate – that’s all I really need from this life. Mate, or mate tea, yerba mate – as you wish! Do you want to feel yourself as a creator of unrepeatable sacred melody while the very music of your heart is done together with the very music of your friends’ hearts? Then we invite you to our CLUB “MATE”! You can make your acquaintance with this ancient and mystically wonderful beverage there. Mate will make your feelings deeper – and unforgettable, for sure. You will also recover your physical and mental strength there with mate as well as you will bring the very taste of life to yourself. 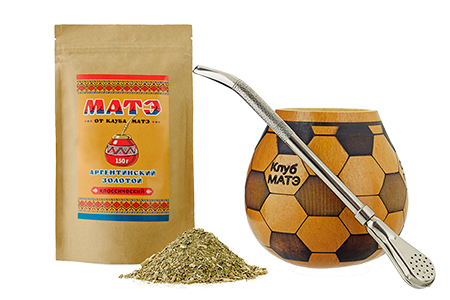 You will be able to take part in a ceremony and buy mate in kalabases in our shop in order to get this pleasure at home or during your working day in office. You will have an excellent opportunity to have a beverage selected according to your Solar sign and to have a piece of advice about a present for a friend. Mate it a thing to be given for the dearest people with best wishes of health and happiness. You should also know that being invited to CLUB “Mate” by a friend means nothing else but a sign of their benevolent arrangement to you. You will know about Maya civilization there – as highly developed one as most scientists are wondered with it. You will also know about their famous calendar, Tzolkin, which is likely to help anyone to understand things happened with our planet. A person with knowledge of his/her Kin can understand personal mission on this planet – and the goal to reach by the Soul. You will also learn how to calculate difficult periods of life in your destiny and in destiny of your dearest ones. This will help you to understand the nature of relationships with every person in your encirclement. It, besides, will bring you an opportunity to see and use your own intuitive abilities, and mate will help you to concentrate on The Universal Mind. The great variety of original presents from many countries will be as good as a real journey to other countries and federations. You will bring a piece of a sun stored there with yourself by purchasing one of things from our oriental shop – even if it is a pair of moccasins done from genuine leather, backpacks, kalabases with bombillas or the best sorts of mate and the great variety of oriental herbal tea. О Клубе - только лучшее. О персонале - только лучшее! О мате - только лучшее! СПАСИБО!